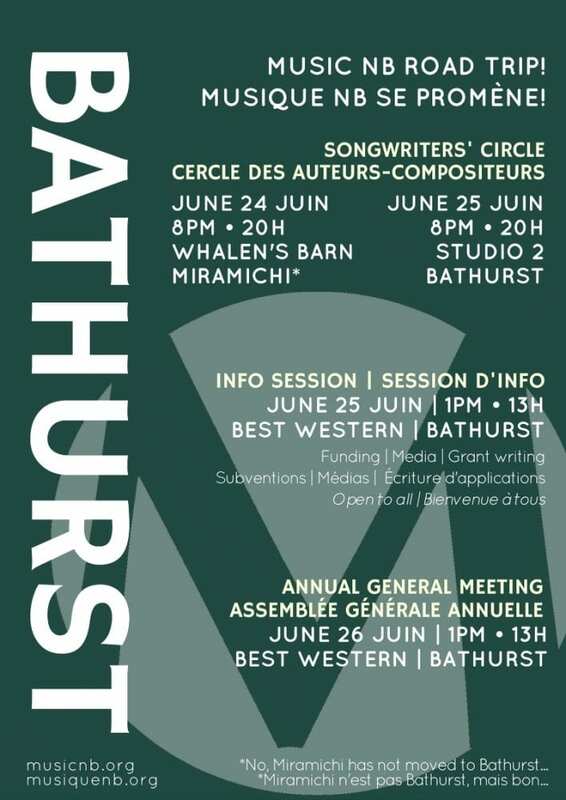 The city of Bathurst hosts the 2016 Music Musique NB AGM June 24th to 26th, 2016. The weekend includes two songwriters’ circles, one taking place in Miramichi, a series of free information sessions about the music industry, and the Annual General Meeting (AGM). Two Songwriters’ Circles featuring Andy Brown, Danny Boudreau, Matt Boudreau, Jaclyn Reinhart and Hayden Wiebe are scheduled. These five amazing New Brunswick singer-songwriters meet on stage to share songs and stories about songwriting. The first Songwriters’ Circle happens Friday June 24th at 8 pm in Miramichi at Whalen’s Barn. You can find Whalen’s Barn at 670 Old King George Hwy in Newcastle, Miramichi. The next night the same artists perform at Studio 2, 125 Main Street, in Bathurst. The event starts at 8 pm on Saturday June 25th. Both Songwriting Circles welcome the general public and cost $10 at the door. The Best Western in Bathurst hosts Information Sessions on Saturday June 25th from 1 pm to 4 pm. Jean Surrette presents funding programs available for musicians at 1 pm. Véronique Wade speaks on effective grant writing at 2 pm. Dawn Després-Smyth presents social media best practices at 3 pm. The public may attend these information sessions. Admission is free. The 2016 Music Musique NB AGM is Sunday June 26th. The meeting gets under way at 1 pm in the Best Western in Bathurst. Only members may vote but anyone can attend the meeting free of charge. For more information about the Music Musique NB AGM visit the website at www.musicnb.org. Email contact@musicnb.ca. This is a syndicated post. You can view the original post here: Music Musique NB AGM.